Notes: Oh my that looks delicious. How much would a meal like this cost? 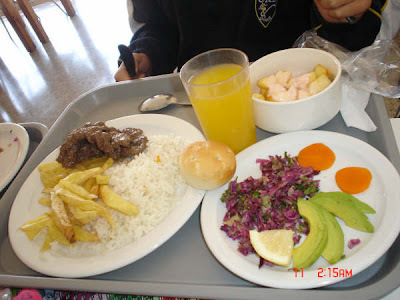 Is it typical of Chilean school lunches? Based on the insignia on the boys jacket, and the nice plates and bowl, I would assume this is a private school. Food in Chile is not so expensive (specially fruits and vegetables). And meat is also cheap compared to european prices. That looks healthy... and still it looks like a private school-- even with your additional information, Karla. Most schools IN chile have a uniform requirement. And yes lunch is very similiar in all schools there. Most schools in Chile require a uniform so thats probably why you see the insignia on their shirt. And yes most lunches look like this there..not many kids in Chile actually eat processed foods. I'm from Peru and yes, most schools in South America make their students wear uniforms. In my country not many school children eat there though. But yes, when they do it usually looks like this too. Starting from de fact that you all speak english, i can think that all of you studied in a private school or a semi-private (particular subvencionado) school. I studied on a private school in copiapó, and yeah lunch was like that, but spend a little time in a public school (municipal), and lunch maybe will have fries but never beef. Instead of beef could have been chicken, and a public school doesn't have enough money for avocado.